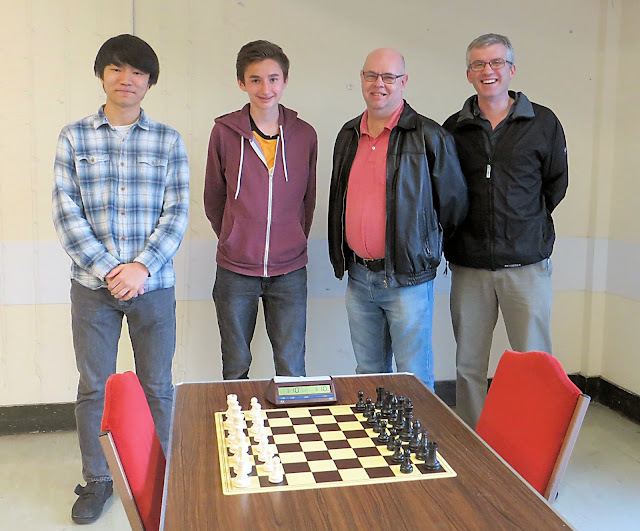 Cambridge Examiners, last year's champions, have retained their title in Division 1 of the Bury Area Chess League. Their winning margin over runners-up Linton A was six points. A further point behind were Bury St Edmunds Scorpions, a team consisting entirely of Ipswich players (Moore, Gregory, Wallis, Lunn, Peck). Player of the Year was Examiners' captain, 16-year old David Redman, who was unbeaten over 12 games (won 6, drew 6). In the BACL, the award goes to the player with the best percentage. Steve Gregory won eight and drew one. The photo above shows the Examiners' main team: left to right, Akito Oyama, David Redman, Rob McCorry, IM Richard Tozer. Examiners managed to field this same team for ten of their twelve matches. The team has an average current grade of 198, higher than any other team in either the Bury Area League or the Suffolk League. Richard Tozer is the only International Master in either league who plays regular league chess. Akito (204) is still only 15 years old, whilst David, a year older, is graded 196. The strength of their team is underlined by the fact that they only lost five individual games during the whole season - and one of those was a default loss!